I have a lot of t-shirts. It's pretty much the only kind of shirt that I wear outside the house, and it's one of my favorite ways to support my interests, be it a band, television show, film or something else in pop culture. Not only am I (potentially) contributing, financially speaking, to these endeavors, I'm making the people around me (more) aware of these things that I enjoy. At the very least I'm making them think, "Geez, how many shirts that say 'They Might Be Giants' does this guy have??" Well, let's find out. I bring you.. 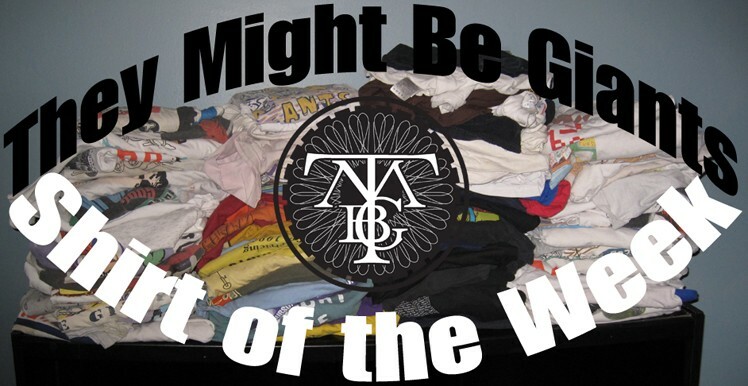 In case you can't tell, I own enough TMBG shirts to take this blog well into 2012. 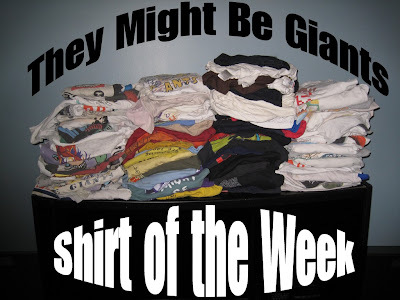 The idea is to have a detailed catalog and history of TMBG shirts, something which I've long felt should be available. There are so many of them and some that plenty of fans have never seen. TMBG shirts are always interesting and fun to look at, often even for people that aren't familiar with the band or their music. I can include details and history that some readers never noticed or were not aware of, and even comments by artists who are interested in participating. The opportunity to advertise for the band when a shirt is still available for sale is a happy bonus.